Baitcasting reels are the choice for those who want to catch bigger fish and use larger lures. These reels are effective at using techniques where light line reels can’t do the job. If you can set up an appropriate fishing gear, you will have more control of your lure and your cast, and you will notice an improvement on your fishing experience. 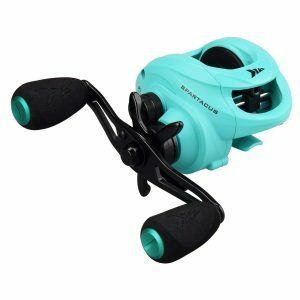 To help you, in this guide we will present our favorite baitcasting reels and we’ll discuss how to choose the baitcasting reel that suits you best. 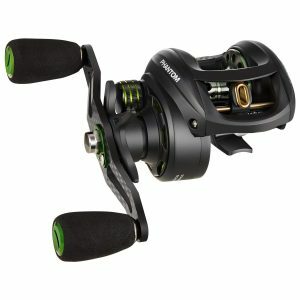 This affordable fishing reel is one of the most popular tournament-ready models. It’s ideal for high-performance fishing but its features are easy to access and understand by the novice fishers too. It offers fast and precise fishing and it gives you the control that you need. Its design is low-profile, meaning that it will not prevent you from maintaining your focus as it’s very silent. The line-retrieve is also quiet and offers high-speed capabilities. 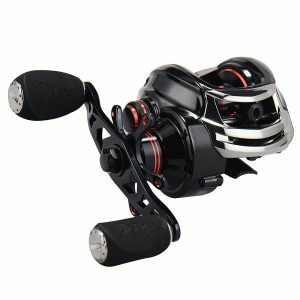 The construction is solid, made of a brass gear structure and supported by a carbon fiber drag system that gives a maximum support of 17.5 lbs. 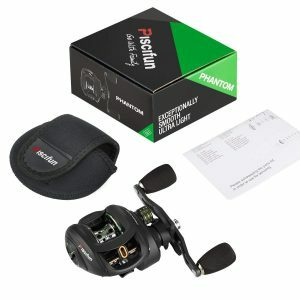 Another great option for beginners is this baitcasting reel from Piscifun. It offers loads of features, amongst which is the dual brake system, built of an external magnetic brake and an internal centrifugal brake. This system offers the possibility to precisely adjust the reel for a variety of baits. Thus it lets you maximize casting distance. The extremely lightweight body that only weighs 5.70 ounces and the super low profile offer great comfort during long fishing days. The 7.0:1 gear ratio also helps in making things more comfortable for the caster. Although light, the frame is solid, made of durable carbon fiber and it provides up to 17 pounds of drag power. Weighing just 7.3 ounces, this model is so light that it can compete in this category against some of the most expensive reels. The single-piece frame and side plates are built of graphite. It feels really solid and it doesn’t wiggle. That’s why it makes you feel in control. The grips are comfortable and even though you might occasionally have slime-covered hands, they will ensure a good grasp. The silent system will make sure that you won’t hear any annoying sounds during your retrieve, and the quality construction will guarantee that you can use the reel for a long time. If you pair this reel with a decent rod you can get some excellent results. It feels light and easy to use and it offers some great balance. This reel presents a setup that can be used for long fishing days and it will cause no fatigue. It has some great casting length and a very fast retrieval performance and that is why it’s very suitable for freshwater activities. The drag system it incorporates uses synthetic washers that are capable of providing 18 pounds of drag pressure, more than you would usually need. This model excels in the retrieval department, offering a 7.1:1 gear ratio that allows the user to fish at a high speed while enjoying a smooth feeling. 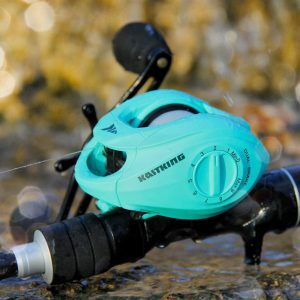 One of the most unique-looking baitcasting reels on the market, this model is made for professional fishermen but can also be easily used by beginners. Its features combine brand new technology with a durable and sleek design and this combination ensures optimal fishing performance. Probably the most important aspect of this device is its dual magnetic and centrifugal brake system that allows for some great hooksets. This system also comes with an anti-reverse feature that limits rear handle movement – a great addition for the beginner fishermen. The frame is made of carbon fiber, it’s light and can withstand a drag of 17.5 pounds. In a market overflowing with options, the challenge of buying the best baitcasting reel for a beginner can be too much. You need to pay attention to a lot of details. Baitcasting reels can be intimidating for the beginners and they sometimes have the reputation of being too difficult to use. But that is not the case if you read a quick guide on how they work. Although the learning curve is a bit steep, once you know how to use such a reel you will experience some great catches. Before buying a reel, you shall first know what you want to use it for – shallow or deep water? Should you get an aluminum or a carbon frame? Would a low profile help you more or should you get a round profile? To answer all these questions it’s crucial for the buyer to do the adequate research beforehand. However, as the research can be time-consuming, we have done it for you and we’ve written a quick guide on how to find the reel you want. If you’re looking to get a baitcasting reel for a relative or a friend, please be aware of the personal preferences of that person, and how he or she intends to use the reel. Baitcasting reels are a great choice for improving as a fisherman and they offer more precision, they let you flip and pitch easier and allow you to use heavier lures. That is why it’s important to get one that suits you well and that is made to last. Before we get into the details of this guide, you need to know that no matter how good your reel is, as a beginner, you will still need some time to learn and adjust to it. Here are some aspects that you need to consider when looking for good beginner baitcasting reels. It might be best to make your first priority deciding what kind of model you want, a round or a low profile one. Each comes with different characteristics so depending on your style you should choose wisely. You can find round profile reels for sale in stores that focus more on heavy-duty fishing. They are made for larger bodies of water, where you can catch bigger fish that swim deeper. Due to the reel design, they offer more power and torque and are suitable for such situations. 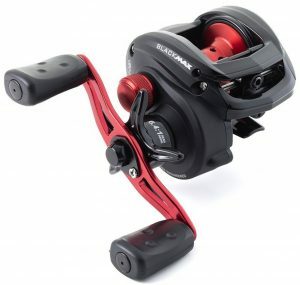 The round shape allows the reel to be gripped from the back and that offers more power. These reels are also capable of withstanding larger lures and they also offer more line capacity and thus are ideal for targeting species like salmon, steelhead or muskie. The low profile models are made for comfort and that is why they are a great choice for beginners. They offer a design with a palm-able grip that makes them suitable for those that like to hold onto the reel while winding. 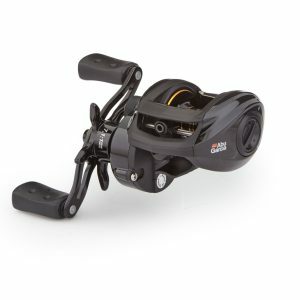 These reels are more ergonomic and are particularly designed to make life more comfortable for the fisherman. It’s a type of reel that works great for bass fishing. Your baitcasting reel should make you feel in control at all times. That is why it’s essential for it to come with an anti-backlash system or an anti-reverse one. You will need such a built-in device to let you manage the speed of the spool when you cast. When looking for reels you will see that there are two braking systems available: one based on magnetic and the other on friction principles. The benefit of the first type is that such models are adjustable and can suit different needs. The friction models automatically control the speed at the beginning of the cast. There are control systems that let you choose between magnetic and centrifugal brakes or allow you to adjust the reel either internally or externally. However, keep in mind that no reel guarantees total safety from backlash, so make sure to learn how to use it before going out for bigger fish. When looking through the reviews of beginner baitcasting reels you will see that there are two material types available. You can choose between aluminum or carbon. The carbon models are lighter and have more flex than the others. That can be a disadvantage if you don’t know how to control it. That is why carbon models are most suitable for fishing in smaller waters like rivers, for bass and panfish. And speaking of rivers, you might also want to have a look at some kayaks for beginners, if you’re more adventurous. If you want to target larger fish, you will want to get an aluminum reel. They are often less prone to flexing and they offer more power. Aluminum is the choice for saltwater. There are also hybrid models made from both of these materials. Regardless of the build material, you must be sure that the reel you want to get is well pieced together and it’s able to withstand the forces and the bend you put on it. You can find cheap baitcasting reels for beginners made of either aluminum or carbon, but you’ll have to make sure they’re well made. Choosing a feature such as the spool size depends on what you intend to use your reel for. If you are a beginner and you’re only looking to start small and go for the smaller fish, you can choose a small spool. It will do its job very well and it will make the job comfortable for you. However, you might want to try and catch the bigger fish right from the start. In this case, get a bigger spool so you will have plenty of line to work with when reeling. Also, if you think you need more line, consider getting a round profile reel, as that kind of model offers more line capacity. The gear ratio represents the number of revolutions the reel makes per turn of the handle. A standard ratio is 6.5 to 1. However, baitcasting reels are made for retrieving the fish more aggressively and that is why they may have a higher ratio of 7.5 to 1. A higher ratio doesn’t necessarily mean better performance, but rather the higher the ratio, the lower the cranking power. It’s a trade-off that the fishermen should know about. For smaller fish, a higher ratio is well suited, but for catching bigger fish you need a lower gear ratio. A 7.5 ratio is a good choice for beginners.